Why yes, I am on an apple kick, why do you ask?! Yeah, after picking 35 pounds of apples during our first u-pick orchard experience, we were pretty much swimming in ’em. It was mostly awesome but, I have to admit, slightly daunting. 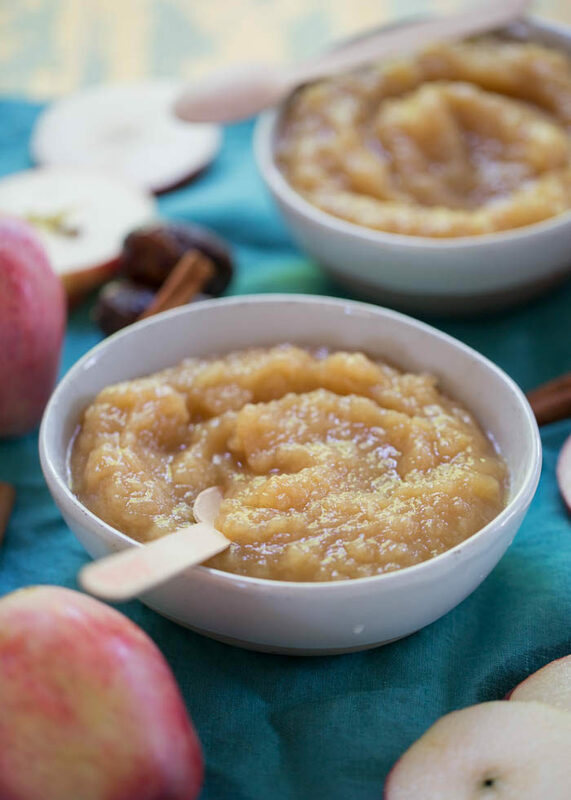 Homemade applesauce is always a great way to use up an apple harvest. So I made applesauce the very first day we had them at home, and then a couple of weeks later, the last few pickins made their way over to applesauce land too. Applesauce land. What a glorious-sounding place that would be. Or actually … *imagination going into overdrive* … perhaps actually potentially terrifying. We should never speak of Applesauce Land again. Speaking of terrifying, this date looks like he has something to say and he’s not too happy about it, doesn’t he? 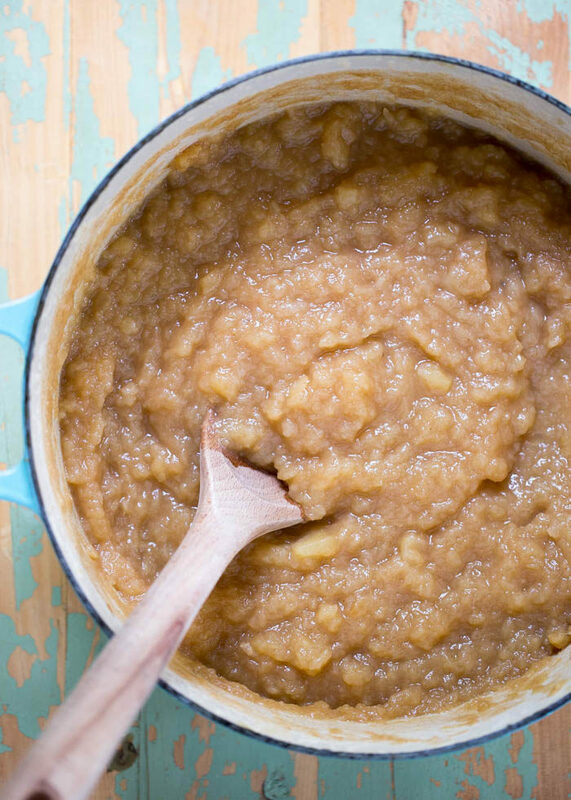 Sorry, date, but you were right, because YOU … you were the special ingredient that took my homemade applesauce game to new heights this fall. … and friends, it makes for some AMAZING applesauce. I mean, caramel and apples are MFEO, right? And date caramel is this sort of amazing stuff made with pureed medjool dates and water – maybe a pinch of sea salt for a salted effect, even. The result is a delicious caramel-like substance made only with whole-food ingredients, and a fruit to boot. Date caramel is what inspired this apple dip recipe, too. So I guess I’m not only on an apple kick, but I’m on a date kick too. There are worse kicks to be on, right? So here’s what we’ve got. Apples. Loads of them. (Both of my batches were made with mostly honeyscrisps, which are already pretty sweet.) Then we have lemon peels and cinnamon sticks, both mandatory in any homemade applesauce recipe I make. Then we simmer with a bit of water until just softened. 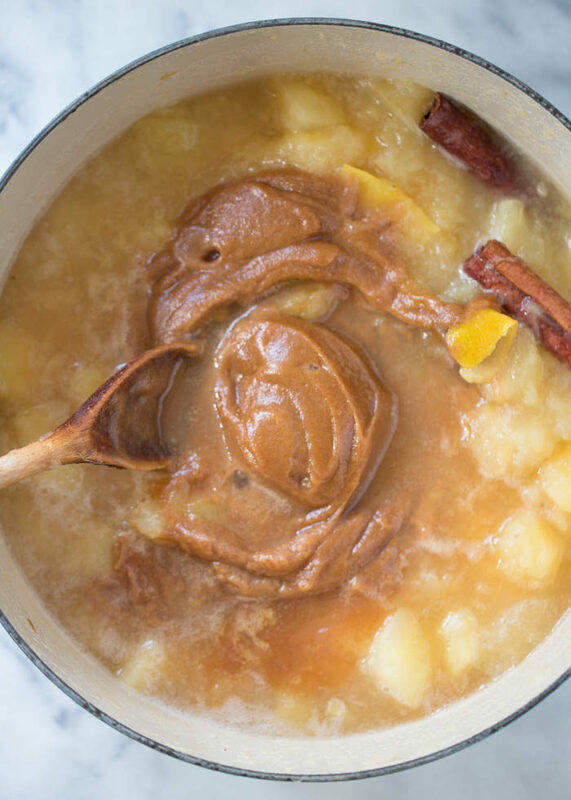 THEN we puree the dates with some water and stir it on in to the bubbling pot of applesauce, giving it a caramelly glow and a warm sweetness that just takes this applesauce over the top. Now, I mostly don’t eat sweet stuff anymore – sugar is a rarity for me. So personally, I am fine with a less-sweet applesauce. You might want it sweeter – or your apples might not have been as sweet as mine from the get-go. If either of these are the case, feel free to add more dates. Or even throw in some plain-ol’ granulated sugar if you’d like. Pure maple syrup makes for an interesting sweetener too. Doctor it up until you smile when you take a taste. Then you know you’re there. So! 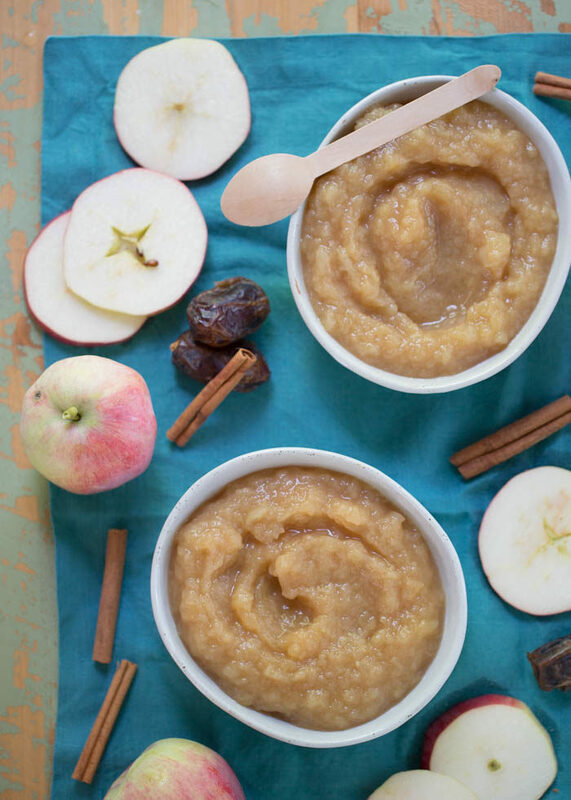 Are you ready to come on over to Applesauce Land? 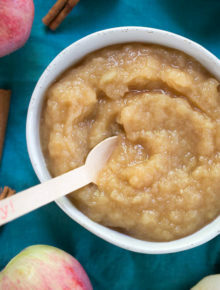 This homemade applesauce boasts an unusual ingredient in place of traditional sugar – pureed dates! Dates give it a warm, almost caramelly sweetness that I’m completely in love with. You can use any apple, but I recommend honeycrisps. They make a delicious applesauce. Add peeled, cored, and chopped apples to a large pot (I use a 7-1/4 quart Dutch oven) along with the cinnamon sticks and lemon peel. Add 1 1/2 cups water. Place on the stove over medium-high heat, bring to a boil, and reduce to a simmer. Cover and cook until the apples are tender, about 20 minutes. 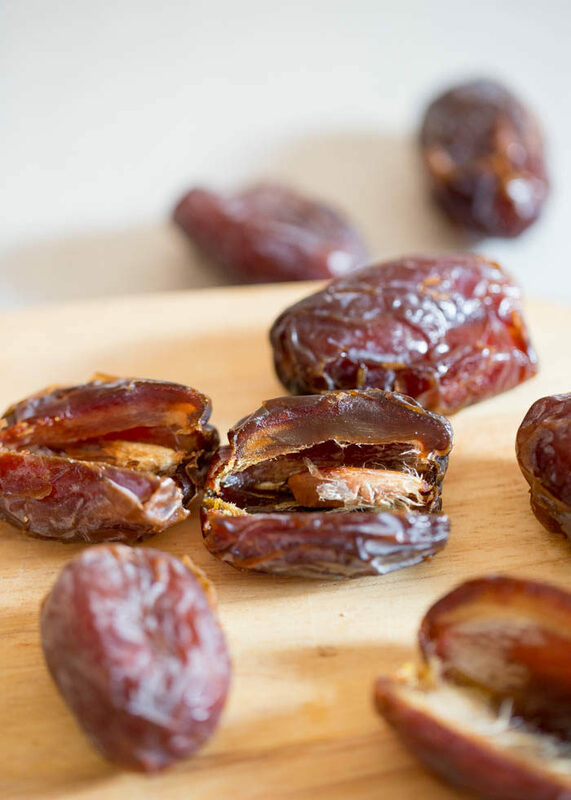 Meanwhile, place the pitted dates and 1/2 cup water in the pitcher of a high-speed blender. Puree until completely smooth, adding additional water if needed to keep things going. If, after the 20 minutes, the apples are tender enough to mash with a potato masher, go ahead and mash them as much as possible. Otherwise, cover them back up and give them a bit more time to cook. Once the apples are mashed and stirrable, add the pureed dates. Stir until combined. Taste and add more sweetener if desired (see notes). Continue simmering until applesauce is the thickness you’d like. I cook it for just a few more minutes and it’s usually perfect. Remove the lemon peel and cinnamon sticks and discard. 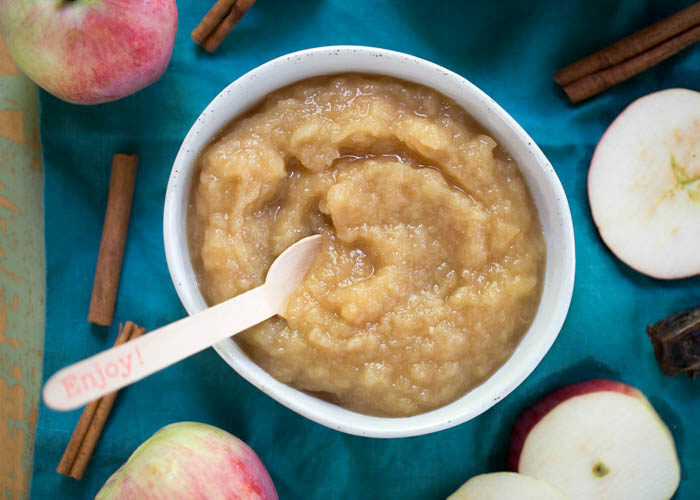 If you want completely smooth applesauce, let it cool and then puree in batches in the blender. Store in airtight jars in the refrigerator. With a batch this big, I usually like to freeze some in jars or freezer bags to enjoy later on. If you desire a sweeter applesauce or your apples didn’t start out as sweet as mine, you might want to add more sweetener. You can puree more dates if you like, or simply stir in some plain-ol’ granulated sugar if you’d like. Pure maple syrup makes for an interesting sweetener too. I’d say add a couple tablespoons at a time until it tastes just right.